Twitter, due to its massive growth as a social networking platform, has been in focus for the analysis of its user generated content for personalization and recommendation tasks. A common challenge across these tasks is identifying user interests from tweets. 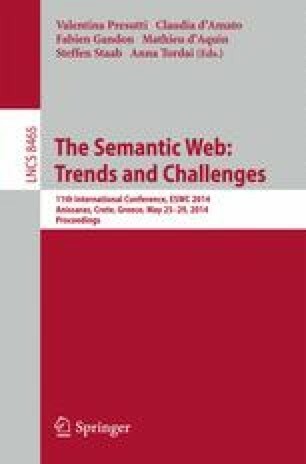 Semantic enrichment of Twitter posts, to determine user interests, has been an active area of research in the recent past. These approaches typically use available public knowledge-bases (such as Wikipedia) to spot entities and create entity-based user profiles. However, exploitation of such knowledge-bases to create richer user profiles is yet to be explored. In this work, we leverage hierarchical relationships present in knowledge-bases to infer user interests expressed as a Hierarchical Interest Graph. We argue that the hierarchical semantics of concepts can enhance existing systems to personalize or recommend items based on a varied level of conceptual abstractness. We demonstrate the effectiveness of our approach through a user study which shows an average of approximately eight of the top ten weighted hierarchical interests in the graph being relevant to a user’s interests. This material is based on the first author’s work at IBM Research, complemented in part based upon work supported by the National Science Foundation SoCS program under Grant No. (IIS-1111182, 09/01/2011-08/31/2014). Any opinions, findings, and conclusions or recommendations expressed in this material are those of the author(s) and do not necessarily reflect the views of the employer or funding organization. We would like to thank: (1) Zemanta for their support; (2) Participants of the user study; (3) T K Prasad, Delroy Cameron, Sarasi Lalithasena, Sanjaya Wijeyaratne and Revathy Krishnamurthy for their invaluable feedback.